Microwave the water until hot. Add the dried mushrooms and let rehydrate. In a large sauté pan heat the olive oil over medium high heat. Add the mushrooms and minced shallot then season with salt and pepper. Cook until mushrooms are tender and golden, about 10 minutes, while stirring occasionally. Stir in the Italian seasoning and remove from the heat. In a large mixing bowl combine the ground beef, chopped onion, minced garlic, rehydrated dried mushrooms and a couple tablespoons of the soaking liquid. Do not overwork the meat, mix until just combined. Divide the beef mixture into four equal portions and form each portion into a 1 inch thick burger patty. Season each side of the burgers with salt and pepper. Cook the burgers on a grill or grill pan until desired doneness. During the last couple minutes of cooking place 1 slice of cheese on each burger. If using a grill pan tent foil over the pan to help the cheese melt. 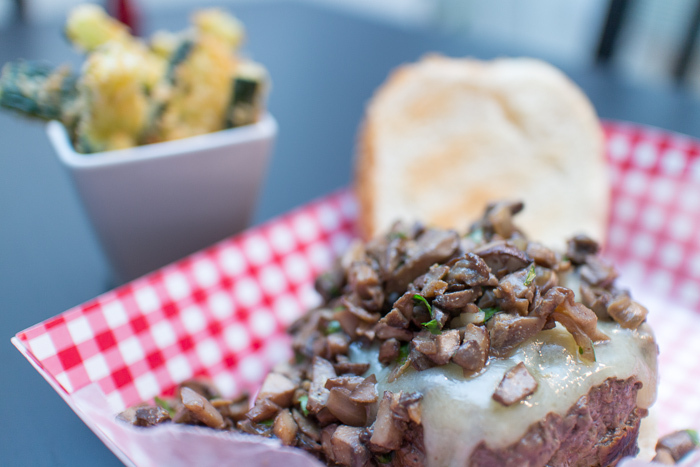 Serve the burgers on the buns topping with a large spoonful of the mushroom mixture.